Note: Messenger campaigns and ManyChat integrations are available only in the Full-Time Seller and Large Business plans. For campaigns in which your customer's code is delivered in Facebook Messenger, you can connect a ManyChat account to capture leads. (Integrating with ManyChat requires an API key from ManyChat, which is available if you are on their pro plan). When setting up a Sent-to-Messenger or Click-to-Messenger campaign, the "Integrations" page has an option to turn on ManyChat integration. Turn this on to add your ManyChat API key. Log in to ManyChat to find your API key. The key will be under "Settings", then "API". Copy the token provided, and paste into the field on your LandingCube campaign setup. You should see a blue checkmark to the right of your API key if it has been successfully connected. -Customers who were not able to claim a code (caused most commonly if the coupon codes run out or reach the daily limit). Make sure you set up the tag in ManyChat before trying to add it in LandingCube. 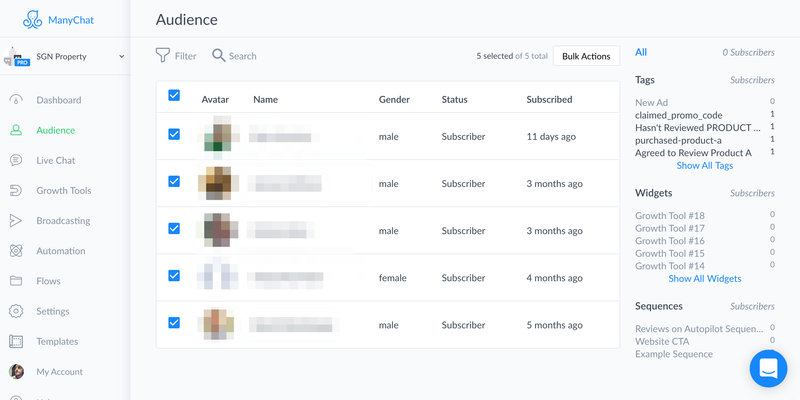 By connecting your campaign with ManyChat, you'll be able to view people who interacted with your chatbot sequence, by clicking on the "Audience" tab in ManyChat. Click on your subscriber to view details on them, including the tags added through LandingCube. LandingCube's chatbot allows you to send three sequences (the initial coupon claim sequence, and two followup sequences), but you may wish to use ManyChat to set up additional flows to your LandingCube subscribers.